Every once in a while a book lands in your hands that really makes you sit upright and really pay attention to the words written on the paper, this was it for me! The book starts with a very well written Foreword by respected UFO researcher and Author Malcolm Robinson (SPI). I have been investigating UFOs in the UK for some considerable years now, and I have come across many theories, stories, explanations given by UFO researchers and investigators for a whole multitude of sightings and experiences that people have had within the whole scope of the UFO topic, mystery or as some call it enigma, this book by Phillip Kinsella does not hide away from giving the reader another way of looking at the whole UFO question and its other connections that merge along the way as you get deeper into the subject, one being the paranormal and also spirituality and its place within the story as to who we are as humans on earth and what that means not only to us, but to those ET's we are coming into contact with over time and in many parts of the world. Phillips begins the book with a very well laid out introduction to who he is, how he become interested in the subject of UFOs, spirituality, mediumship-clairvoyance and the paranormal, giving detailed stories of encounters with many individuals over his lifetime, and detailing childhood experiences which were quite fascinating to read, almost placing you the reader next to him at the time of the events happening (a good sign of a good writer! ) many of those early experiences were shared with his twin brother Ronald, also a well established Author and artist, his early UFO encounters were quite beautifully written, it actually triggered memories of my own very first UFO experiences and so it made me the reader have a great deal of shared empathy as to what Phillip and his brother were experiencing at that time of the events unfolding on the night in question, also Phillip takes the reader on a journey as to how he became a medium, and the meetings he had with other mediums, spiritualists and clairvoyants, and the messages they gave him as to the direction his path will take him, and through the story you will see how his life story panned out in respect of his UFO and spiritual - mediumship journey. I am not going to give too many spoilers away about this book, it does cover a very wide range of issues that are presently debated by many people within the UFO and Paranormal and spiritual communities across the globe, but one issue Phillip addresses well, is too make you think a lot wider on some of the ET interactions with humankind, especially in the area of “Alien Abductions” of which Phillip reveals his own personal abduction experience ( I could clearly sense that was a very traumatic experience that Phillip describes in the book and one I would imagine does take a lot to recall or revisit even when writing it down for a book, so I highly commend Phillip for revealing this in the book). As regards to Alien Abductions, Phillip manages to break it down in a very well easy to navigate format as to what may be the answers or explanations for those who are carrying out such interactions with humans on a regular basis across the world, this was very good to see and also ask, in respect of, who are they, where do they come from, what are they really are interested in us as a species, and how do we place these encounters within our own lives when they occur to us. There is a good look into the spiritual side of humanity, what the human soul is, how we operate on an energy level as beings who have the use of a higher consciousness, the power we have within us as humans from a spiritual perspective, and how that does overlap within the whole Alien-ET Human story. I am sure you will find like I did, this to be a very welcome input into the debate on why we have the experiences we do, and what we get from those experiences and most of all what do they mean to us as individuals who are on this amazing journey we call life! Overall I found A Passage Through Eternity to be a well written, clearly laid out and thought provoking book from an author who has had a lot happen in his life as far as Alien ET interaction, and hands on spiritual work that gave him an immense pool of factual data to draw upon when compiling this book, a great read and one that I would I recommend to any UFO reader and readers of spiritual paranormal and enlightenment topics too! 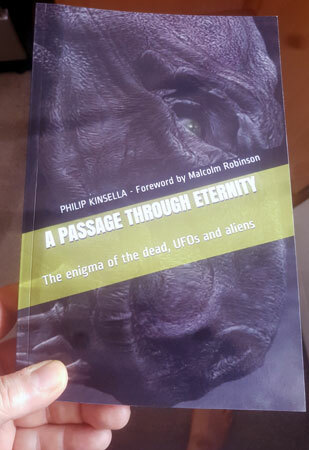 You can buy Phillips book at Amazon at the following link: https://www.amazon.co.uk/PASSAGE-THROUGH-ETERNITY-enigma-aliens/dp/197706728X/ref=sr_1_fkmr0_1?